On November 1, the 16th China International Agricultural Products Fair opened in Changsha, Hunan. Special agricultural products from all parts of China and 24 countries and regions across the globe gathered here. 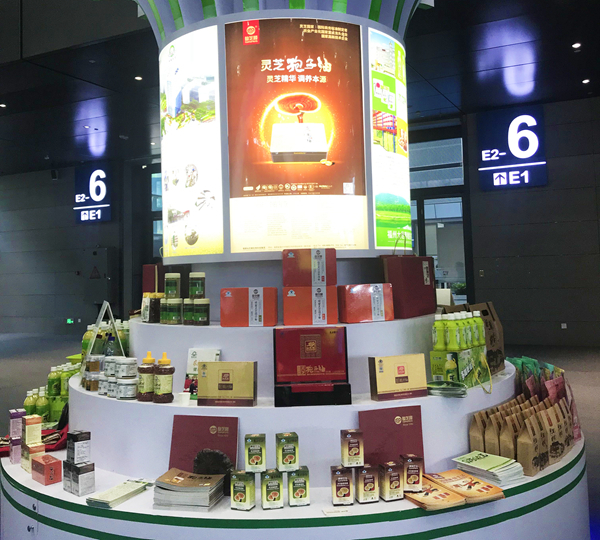 After the strict review and selection of the organizing committee, GANOHERB's Ganoderma finally appeared at the Agricultural Fair as one of the characteristic agricultural products in Fujian which highlighted the charm of [Fresh Fujian Green Agriculture". GANOHERB has continuously participated in the Agricultural Fair for 14 consecutive times since 2005 and basically won the gold medal for agricultural products trading in each exhibition. The performance of GANOHERB this year is worthy of attention. Fujian is a large province of edible and medicinal fungi, and Ganoderma Lucidum is a treasure of Traditional Chinese Medicine. The exhibits of edible and medicinal fungi represented by GANOHERB's Reishi Mushroom were welcomed by the scene. Many merchants are curious to stop and ask about the efficacy of GANOHERB Ganoderma Lucidum deep-processed products. Chen Mingwang, Deputy Director of Fujian Provincial Department of Agriculture, visited GANOHERB booth for Ganoderma lucidum spore oil softgel and other products. After learning the processing technology and product features of GANOHERB Lingzhi products, he said," GANOHERB can represent Fujian's characteristic agricultural industry." he also praised GANOHERB for the inheritance of Traditional Chinese Medicine by means of science and technology. He also hoped that GANOHERB would develop better and Ganoderma lucidum could benefit more people. The development of modern agriculture is inseparable from the investment in science and technology. GANOHERB has two national-level Ganoderma Lucidum R&D centres and has hired many domestic and foreign experts as technical consultants to establish a strong scientific research team. The academician Workstation of GANOHERB established jointly with Academician Yu Dequan of the Institute of Materia Medica of the Chinese Academy of Medical Sciences has made many achievements. At the exhibition, GANOHERB displayed a variety of high-tech patented products such as Ganoderma lucidum spore oil and displayed the high-tech production process of Fujian Lingzhi to guests at home and abroad. GANOHERB has unswervingly practised the guideline of "boosting the agriculture with quality, eco-friendliness and brand" as the leading brand in Lingzhi industry. GANOHERB took the opportunity of this exhibition to absorb the successful experience of other superior agricultural products in order to constantly optimize the quality of products and services, develop the rustic economy and benefit the health of people with the magic efficacies of Reishi products.